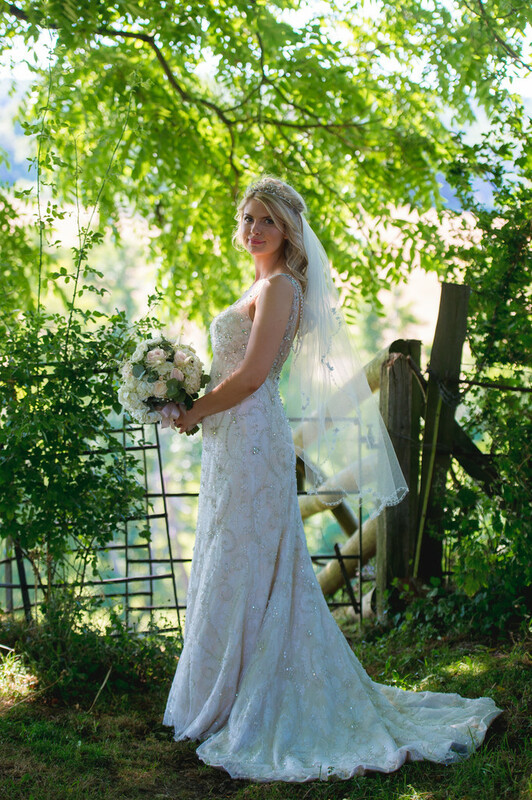 A bride stands in the Stourbridge countryside after her church wedding. After the church service, we allowed the guests to depart to the wedding reception whilst we stayed behind to take some photos in the grounds on the church. The weather was extremely hot, and we had unbroken sunshine and not many areas of open shade. Allowing the wedding guests to move onto the wedding reception early meant that they could enjoy air conditioning and a cold beverage sooner - there was no need to keep them in the hot sun at the church. To the one side of the church was a steep hill, leading off into the beautiful countryside below and with a view for miles. We were lucky in that a overhanging tree provided some much needed shade - allowing the bride to get out of the hot sun, but also making photography a lot easier! 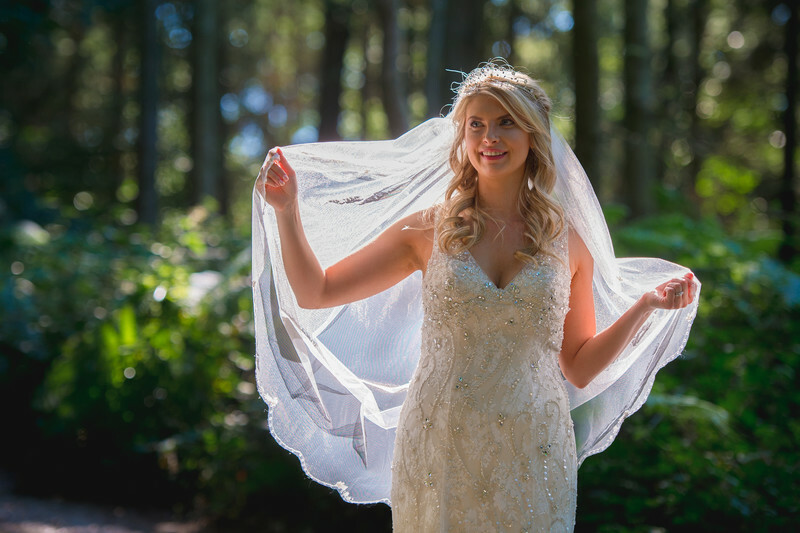 Direct sunlight on a wedding dress can make life slightly difficult for a wedding photographer - The white of the dress reflects sunlight so much better than skin does, and a dark groom's suit absorbs the sunlight, making for an image that's plagued with contrast. One of the ways of getting around this is to find an area of open shade. Open shade on a sunny day gives a wonderful soft light that's very flattering. 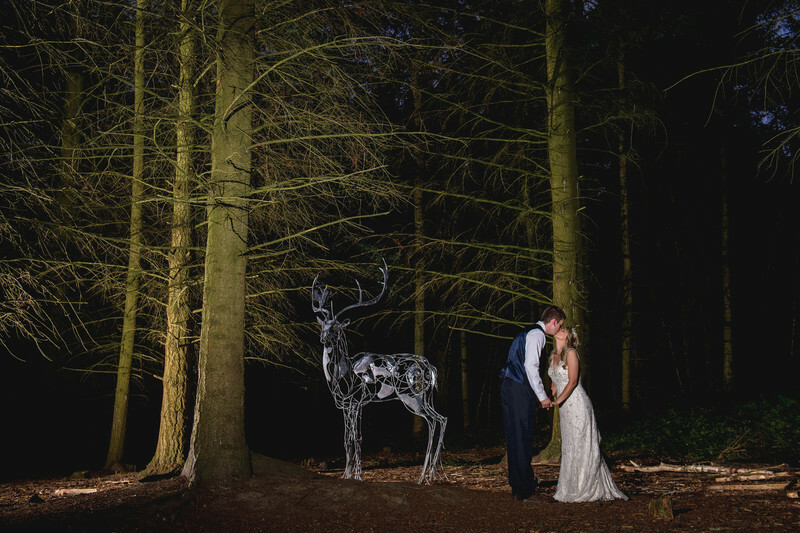 We took a few snaps here before moving onto the wedding reception ourselves. Location: Stourbridge, West Midlands .